It’s no secret that snacking occasions can mean big business for convenience stores. Snack sales are projected to be $200 billion by 2020, and snacking is growing by 5% annually to account for more than 45% of all eating occasions.¹ Seeing an exciting opportunity for its customers, The Coca-Cola Company created the Perfectly Paired Snacking Solutions tool to provide an informed snacking strategy that leverages its custom research. Specifically, the Perfectly Paired Snacking Solutions program reveals shopper strategies and presents several new assets to drive basket penetration with snacking occasions. Perfectly Paired Snacking Solutions is important for reaching consumers since 52% of all snacking occasions include a beverage. Customers can create customized, in-store activation plans using Perfectly Paired Snacking Solutions to help fill shoppers’ baskets with both Coca-Cola® beverages and snacks. The new tool includes inspiring features and expanded partnerships in order to win shoppers in convenience retail, grocery stores, and supermarkets. That’s great news for Coca-Cola customers when a trip that includes a beverage and a snack tends to bring almost twice the dollar value as a trip that includes just a beverage, or just a snack. When it comes to snacking, research shows that 62% of consumers shop with an occasion in mind and choose Coca-Cola® beverages and snacks based on three core occasions: me/we time; on-the-go; and entertaining.⁴ Based on this understanding, the Perfectly Paired Snacking Solutions tool allows customers to create activation plans based on snacking occasions, as well as store zones and snack partners. 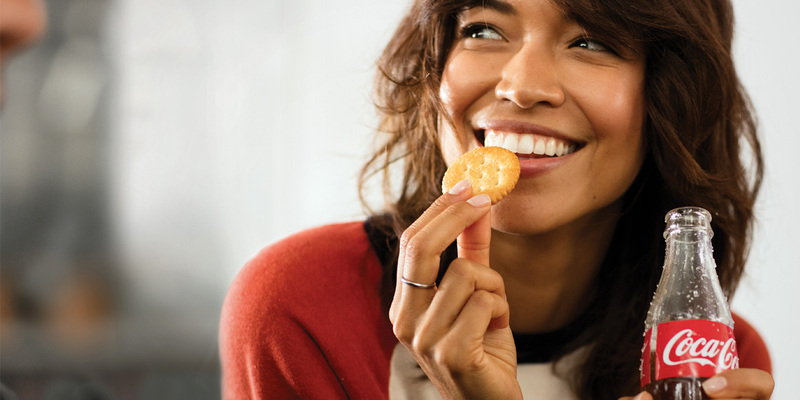 To learn more about how to leverage the Perfectly Paired Snacking Solutions tool and find out more about the snacking + beverage opportunity, talk to your local Coca-Cola representative today. ⁴ 2014 Target Report of the Changing Beverage Market, Multi-Sponsor Surveys, Inc.